British architect David Adjaye has released a revised version of his firm's first New York high-rise: a 66-storey concrete skyscraper in Downtown Manhattan. The newly released official renderings show a much different design to the conceptual images leaked earlier this year, which depicted the skyscraper with golden facades. Instead, the residential tower on William Street in the Financial District will have a textural hand-cast concrete exterior, designed to complement the materiality of the surrounding historic, brick commercial buildings. Another feature that take cues from these buildings is the "rhythmic" layout of the arched windows that puncture the lower half of the tower. Openings across the upper portion will also have a regular pattern, but will be flipped so that the curve is at the base and much larger. The tower appears to slightly fan out towards the top to accommodate them. "The design for 130 William acknowledges the tower's location on one of the city's earliest streets," said Adjaye. "Understanding that rich history, I was inspired to craft a building that turns away from the commercial feel of glass and that instead celebrates New York's heritage of masonry architecture with a distinctive presence in Manhattan's skyline." By straying away from the stark glass design typical to New York's skyline, Adjaye's first skyscraper in the city is among a series of recent proposals that look to the past for inspiration. Examples include residential towers by DDG and CetraRuddy that are influenced by the art deco style found all over the city. 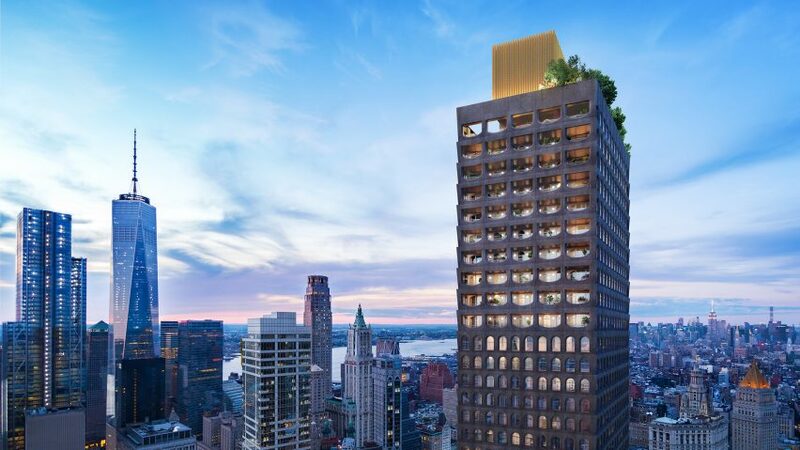 Adjaye has teamed up with local firm Hill West Architects to design the tower for the Lightstone, which accidentally leaked early imagery in May this year. At the time it was dubbed "The Wall Street Tower" but it is now called 130 William Street after its location, which is close to other high-end developments like Frank Gehry's shimmering New York by Gehry tower. But the 244 luxury condominiums in Adjaye's will reportedly be sold at a lower price than competing developments, as Lightstone acquired the site at a below market rate. "David Adjaye is one of today's most preeminent architects and we are thrilled to be collaborating with him to bring an iconic building to downtown Manhattan," said Lightstone president Mitchell Hochberg. "The design for 130 William simultaneously embraces the architectural legacy of Manhattan's downtown neighborhood, while offering luxury condominium residences that discerning buyers will find is unlike anything on the market." Currently under construction, the skyscraper will house a range of residences from studio apartments to five-bedroom homes, as well as penthouses that will have double-height living rooms that open onto terraces. Outdoor areas will include a rooftop observatory deck offering views across the city from nearly 800 feet (243 metres) high, and a park at the entrance. Inside, a host of luxurious amenities like a dark and cavernous swimming pool and spa, and a kitchen and private dining area catered by a chef, will be available to residents. A yoga studio, a basketball court and a private IMAX cinema, a golf simulator and games room are also among facilities planned. Adjaye, who was recently knighted, gained fame in the US for his National Museum of African American History and Culture in Washington DC. His firm, which has offices in New York and London, is now working on number of projects in America, from a library and events complex in Florida and a spy museum in New York to a concrete art museum in Texas.